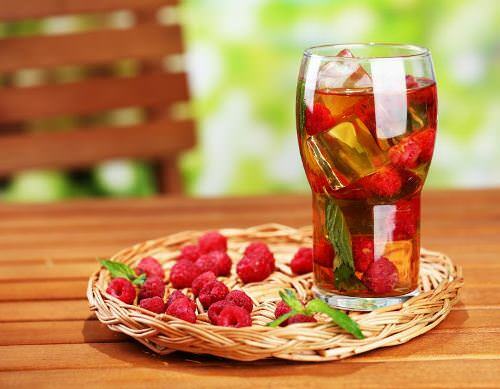 Unique, bright and colorful, raspberry iced green tea is delightfully fruity and tart. You can serve with raspberry ice cubes or lime slices, if you want. In bowl or heatproof measure, steep green tea in 8 cups of boiling water and discard bags after 5 minutes. Meantime, in saucepan, bring 1 cup of water, raspberries, and sugar to boil. Lower heat and simmer until raspberries are soft and broken down. Add to tea, let it cool for about 30 minutes and put in your fridge for about 2 hours. Strain mixture through cheesecloth-lined sieve, discard solids, and serve with some ice cubes.